FRESH WATER, ONE OWNER BOAT Stored indoors for half the year. Both helms have full instrumentation and electronics. A limited production boat featuring the warmth and luxury of beautifully detailed and crafted teak interior. The survey says ?Bristol.? CONSTRUCTION Hull to waterline is solid fiberglass; topsides are foam cored. 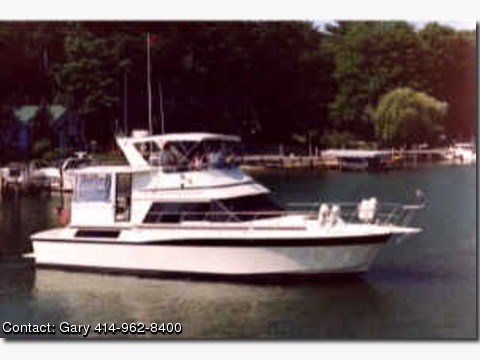 Decks, superstructure, bow pulpit, radar arch, and swim platform are of balsa cored fiberglass. The bonding of deck-to-hull is by 6? on center bolts and entire joint is glassed internally. All interior fiberglass is fully finished with no exposed or raw edges. This makes keeping the bilges ?clean, clear and sweet smelling? very easy. Accommodations There are TWO STATEROOMS that accommodate queen size inland beds. One is forward; one is aft. Both staterooms have complete heads which feature defined shower stalls. BOTH HEADS have exhaust fans. Drawers and hanging lockers are abundant throughout. GALLEY and separate DINNING area are forward and ?down? and are open to the salon above. The boats forward windshield forms a skylight and a ceiling height of approximately 10? for these two areas - Very dramatic as well as functional. Dining table is an electric high/low table that is easily convertible for sleeping. Refrigerator/Freezer: Norcold DE-828 (ac & dc) Electric Stove: Seaward Princess (3 burner w oven) Microwave: Panasonic The SALON features an entertainment center and a complete lower helm. When not in use, the lower helm is tastefully hidden within a roll-top desk . The boat rides very level, which provides excellent visibility at the lower helm. Radar: Furuno (4? open antenna with 48 mile range) Remote on Flybridge Radios: Icom 55B - Both Auto Pilot: Robertson AP200DL with F200 Remote for Flybridge GPS: Garmine GPS 75 (CE) - Both Navigation : Navtrec on Texas Instrument laptop Log/Speed/Depth/Temp: Dart Multi with 2 Stations Instrumentation: Dual VDO - Both The ENGINE ROOM is accessed through the stairs that service the galley and dining areas. The engine room is entirely sound shielded. Besides housing most of the boats mechanical equipment, the engine room als accommodates the clothes water/dryer. Washer/Dryer:Bendix Model #WDS 1043 Oil exchange System: Groco Reversing Pump Fresh Water Pump: Groco ?Paragon? #PJR (Plus spare) Raw Water Washdown	: ITT Jabsco #36950-1000 Battery Charger: NewMar HDM-3 Hydraulic Steering: Hynautic Synchronizer: Glendinning Auto Fire Extinguisher	Fireboy Automatic Halon 1301 System Fuel Tanks	: Aluminum The enclosed AFT DECK is great for entertaining with its U-Line SS45A ice maker, sink, volume controlled speakers and cable connection. Solid glass wing doors provide easy access to the wide flat side decks. This is a very crew friendly boat. The COCKPIT has raw water washdown, a hot/cold fresh water shower, transom door to swim platform (with swim ladder), and great storage. The generator is housed under the cockpit deck. The generator is enclosed in a sound shield and exhaust is quietly discharged at the transom. The FLYBRIDGE has bench seating and a center positioned helm with helm chair. The bimini is storable, which provides the option of running from an open air helm. (Remember you have another complete helm that is in the HVAC controlled weather tight salon.) OTHER ITEMS OF INTEREST - The stainless steel ?Danforth? type anchor (spare is in cockpit) is attached with 125? of chain which is attached to 200 ft of line. In addition to the Maxwell Nilsson VWC 1000 electric windlass, there is a raw water washdown to rinse sand and mud from the rode and anchor. Spare props stored in cockpit. There are cable and speaker wiring throughout. There are 3 Marine Air HVAC units that service the interior. All gray water and the HVAC discharges are drained internally to be quietly discharged at the transom. At anchor your neighbors will not if you are running the HVAC, taking a shower or even hear the generator. The warmth, comfort and beauty of the interior is breathtaking. The quality and detail is unsurpassed. Oriental rugs accent the teak and holly interior decking. In addition to the switched overhead dual voltage (12 dc & 120 ac) lighting throughout the interior, there is decorative valance and art lightning. REQUEST THE CD WHICH INCLUDES ADDITIONAL PHOTOS, EQUIPMENT LIST, MAINTENANCE LOGS, AND SURVEY.